What does the dentist near me offer? If you’re like most people, you like to know your options, and that includes dental care. You ask yourself, “What can the dentist near me do for my teeth?” You want to step into the office knowing that you’ll be taken care of, no matter the situation. Dr. Jessica Emery and her team work hard every day to provide you the array of services to suit all your needs now, and in the future. Here is everything you can expect from your dentist in Lakeview. Dr. Emery knows the best way to preserve your teeth is to stop problems before they start. She has two main tools for doing this. The first is the most basic: a dental cleaning. Brushing and flossing at home are some of the best ways to keep your teeth and gums healthy, but they can’t do everything. You simply have too many tiny surfaces on your teeth to reach yourself. This is where a professional cleaning from a skilled hygienist can help. Their specialized tools and trained eyes can address these trouble spots and protect you from tooth decay. The other method is a standard check-up. This examination can help catch any issues you might have before they become serious. The earlier they are found, the easier they are to treat. A cavity that might only require a small filling now may need a root canal and a crown later. Many dental concerns are hard to notice in their early stages and take a long time to develop, which is why you should get a check-up at least twice a year. Broken and damaged teeth need to be repaired so they can keep functioning, and the right type of restoration is important for their longevity. Crowns and bridges can both fix your teeth and replace those that are missing. Each restoration is custom made for you, and only the top dental labs are used to fabricate them. Whenever you come to get one of your teeth repaired with Dr. Emery, you can know you’ll be able to rely on it for years to come. Perhaps you just want your smile to look its best. We have you covered with a variety of cosmetic services. You can take off years of stains and brighten your smile both in-office and at home with teeth-whitening. Old, unsightly metal fillings and crowns are now no longer the only options to fix cavities and broken teeth. Tooth-colored fillings and porcelain crowns can both repair your teeth more effectively and seamlessly blend in with your smile. Want to straighten your teeth without having to get braces? 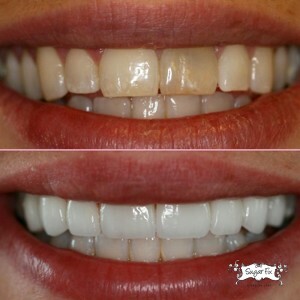 Snap-On Smile can give you instant results, and is one of the most affordable cosmetic treatments available. You can even completely makeover your smile in two easy visits thanks to porcelain veneers. They are extremely thin ceramic shells that are fitted to the front of your teeth, and can correct a variety of cosmetic issues such as damaged, discolored, and slightly misaligned teeth. They are also the best way to help close obvious gaps. Missing teeth can lead to a multitude of problems. Firstly, they can make it uncomfortable to do regular things like speak and eat. They can even affect your bite, as teeth will commonly move into the gap and shift their alignment. They can also have quite an impact on your appearance and affect your self-confidence. One of the most complete ways to bring back your smile is with dental implants. Dental implants are special in that they restore your tooth both above and below the gum line. A new titanium root is surgically placed into your jaw to provide a strong foundation for a brand new tooth. This root naturally bonds with your jawbone and can help ensure the long term health of your whole mouth. It is usually topped with a porcelain crown to make the restoration complete and look natural. Dental implants are also very versatile and can be used to replace a single tooth, support a bridge, or anchor a set of dentures. Dr. Emery and her team are happy to be able to complete the entire implant procedure in office, unlike many other dental practices that would need to refer you to an outside oral surgeon. If you find yourself in any of these situations, call us immediately. We will always try to see you the same day as your emergency, as well as instruct you on what to do in the moment. Are you nervous about going to the dentist? If you are, just like millions of other Americans, you may be able to benefit from sedation dentistry. Utilizing a variety of techniques, Dr. Emery and her team can completely numb you to any physical discomfort, as well as calm your anxious thoughts. Each approach can be tailored to suit the needs of each individual patient, and we will always listen to your concerns so we can keep you comfortable at all times. If you’re searching for “a dentist near me” in Chicago – we’re glad you’re here! Come meet Dr. Emery and her fabulous team today!